You couldn’t tell by his name – Austin Smith – that he is a Muslim, but it comes out at the end of the video below when his cousin identifies him as a Muslim. He was arrested by Phoenix police for four killings — his wife, two of his daughters and the man with whom he believed his wife was having an affair. The wife Dasia Patterson was the first person killed. 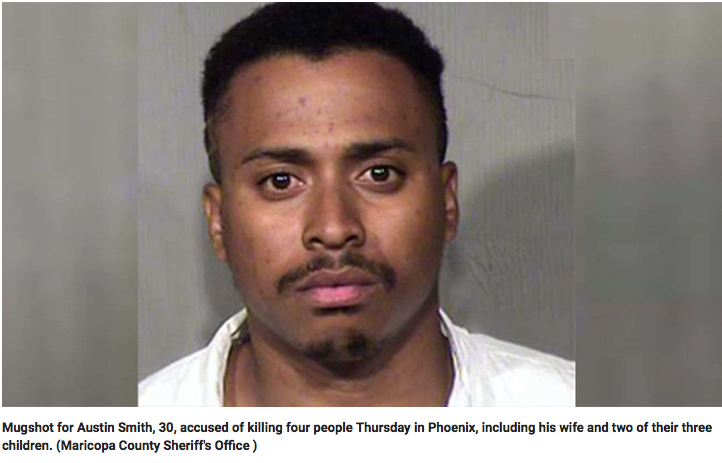 She was fatally shot after Smith confronted her about the affair, Fox 10 Phoenix reported. After her denial, that’s when he told police Allah told him to shoot her, the station reported, citing court records. 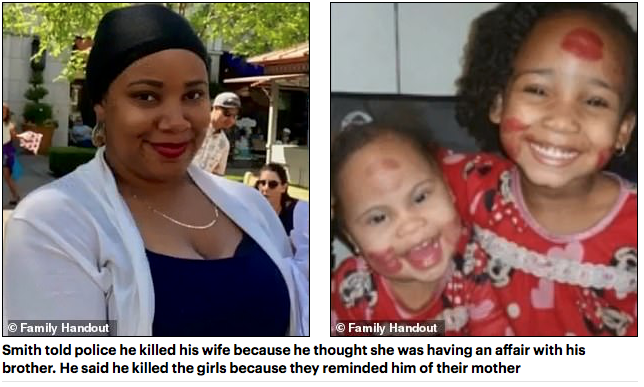 He told police he next killed 5-year-old Nasha because she was going against God’s law and then killed 7-year-old Mayan with force because she was weeping for the wicked, according to the station. According to court documents, he said spared his three-year old who was found hiding under a bed because she reminded him of himself. The court records say Smith punched Mayan, threw her in the air and onto the floor, and then struck her in the head with a baseball bat. The fourth victim, Ron Freeman, was killed after police said Smith drove to his brother’s apartment. At the apartment, two other people were shot but survived, a 47-year-old woman and a 33-year-old man, the paper reported. When we look at the underlying ideology that drove his behavior, we also have to conclude that believing that such actions are sanctioned by Allah is quite motivating. While Smith may be a convert to Islam, those steeped from birth in the honor culture indicative of many Muslim countries have taken in this ideology in a rational way – and when circumstances presented themselves, many have seen fit to act on it. NEVER ever trust the names. Well, we see that Allah is becoming more modern and keeping with the times in ordering people to slaughter their loved ones. No more knives, or stones! Allah ordered His faithful to shoot on his orders! When are we going to wake up to the Truth about this evil Cult masquerading as a legitimate faith? Use whatever tool at your disposal. That’s pretty much what Allah said. Muslims also REJECT other very important Biblical Laws. Almost all of the things that God in the Bible, forbids, Islam/Quran says to do. so have the liberals in the united states. it’s pretty hard to be a socialist if you can’t covet thy neighbors goods. americans should post the ten commandments everyplace they can. Good Three less Muslim breeders On this earth. The evil demon god made him do it. No wonder they all have mental health issues. The demon possesses them. More likely, they’re all barbaric savages. At least he killed off his own future terrorists and/or terrorist breeders, rather than a pair of innocent infidels. NO, it wasn’t GOD, it was ALLAH. It’s in the muslim faith to kill as punishment. Punishment could be for reason they deem fit. Take note that in this entire TV Report the word “allah” was not mentioned once however “god” was mentioned twice, as in “god told him to do this”.